The ASUS Z270-WS is ideal for prosumers and content creators with 1-click overclocking from 5-Way Optimization, ASUS Pro Clock Technology, and 4-Way Graphics support featuring Safe Slot protection. The Z270-WS maximizes connectivity speeds with rear panel USB 3.1 Type A & C, Dual Intel Gigabit LAN, and on-board dual M.2/U.2 slots. 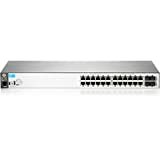 The HP 2530 Switch Series consists of four fully managed Layer 2 edge switches, delivering cost-effective, reliable, and secure connectivity for business networks. Designed for entry-level to midsize enterprise networks, these Gigabit Ethernet switches deliver full Layer 2 capabilities with enhanced access security, traffic prioritization, IPv6 host support, and optional PoE+, and include a product lifetime warranty. Each 2530 switch has 24 or 48 RJ-45 10/100/1000 ports and four small form-factor pluggable (SFP) slots for fiber connectivity. For customers implementing Power over Ethernet for voice, video, or wireless deployments, the HP 2530-24G-PoE+ and the HP 2530-48G-PoE+ Switches are IEEE 802.3af and IEEE 802.3at compliant with up to 30 W per port.